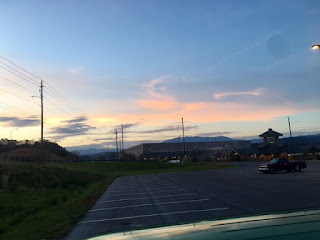 This was our view out the front window at the Leconte Center in Pigeon Forge, Tennessee. This is our view out the front window this week. We are parked outside and parallel to the barn. Obviously the picture above was taken way after dark. We arrived and parked about 4:00 PM, but neglected to take a daylight picture then because we were in a hurry to see the view below! Thank you for dropping by to read our Mile Marker today. May God bless you with a wonderful Sunday and a great week.